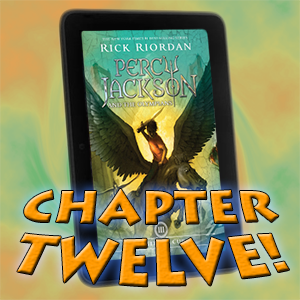 Riordan certainly is making a Herculean effort in writing The Titan’s Curse! Inspired by Apollo’s efforts earlier in this book, I have decided to review this chapter entirely in haiku! Think you can take it? Brace yourself, because ready or not, here we go! Never stops in a good place. Her parents are gone but rich. She’s nice to talk to. Don’t let that fact slip. Wearing police gear and guns. Rick Grimes would be pissed. But then came back together. But her dad’s god of the sky. …We have to RIDE IT? Pan is back, I think. Or is it just Pan’s echo?